Mardy Fish will compete in the 2011 Atlanta Tennis Championships. There will be no question that the weather will be warm this summer when the 2010 Western & Southern Financial Group Masters takes place August 16-22 in Mason, Ohio, just north of Cincinnati. And you can be equally sure that the friendly mid-western hospitality for which this event has come to be known will be just as warm. Recognized for its legendary player hospitality over the years, the tournament has been taken to another level this year thanks to a multi-million dollar upgrade. A new 52,000-square-foot building has been constructed at the Lindner Family Tennis Center which will house player locker rooms, a fitness center, dining area, a player’s lounge and patio. The project upgrades, which also included a new media center, additional luxury suites and covered loge-level seating, were done in anticipation of 2011, when the men’s and women’s tournament will be combined and played simultaneously. The men’s tournament, featuring a 56-player draw, is an ATP World Tour Masters 1000 event. All of the top players are automatically entered. 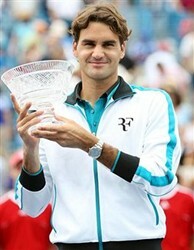 This year's notables in the field will be 2009 defending Masters champion Roger Federer and world No. 1 Rafael Nadal - the principals in tennis's top rivalry - along with No. 2 Novak Djokovic. Nine of the current Top 10 in the world are scheduled to play the event, along with 2010 Olmypus US Open Series tournament champs Mardy Fish (Atlanta Tennis Championships) and Sam Querrey (Farmers Classic). The inaugural men’s event was played in 1899, making it the longest running U.S. tennis tournament still played in its host city. "It’s a major summer staple in the community," said tournament director Bruce Flory. "Many people plan their vacation around the tournament. It’s truly an international event with a major local impact." Fans coming to the Western & Southern Financial Group Masters can also attend a variety of special events. There are two Kids Days scheduled as well as a High School Day. Other events include "Night at the Net," where college alumni groups can attend a special reception. The always-popular Macy’s Ladies Day features a fashion show and brunch. The men’s and women’s events in Cincinnati play an important part in the Olympus US Open Series as both (along with the Canadian tournaments) offer the top amount of bonus points. The tournament champion is awarded 100 points while the runner-up receives 70. "The Olympus US Open Series is huge. It’s done a great job because it’s critical to have all of the summer tournaments linked together," Flory said. "It is great to be associated with the US Open, which is such a prestigious sporting event"